He joined two legends Sachin and Dravid in the list. Virat Kohli has maintained splendid form recently. On a tough wicket where most other batters failed he played a sensational knock of 92 runs at the Eden Gardens, Kolkata. While many were disappointed as he missed out on his 31st ODI century which would’ve put him ahead of Aussie great Ricky Ponting in the most centuries list, he went on to achieve another record. In process of the innings, Kohli went on to become only the third Indian batsman to score 10,000 runs across formats in India’s victories. The two Indian batsmen ahead of him in the list are the legendary Sachin Tendulkar and Rahul Dravid. Kohli has contributed 10,059 runs in India’s wins across formats. He follows Tendulkar (17,113 runs) and Dravid (10,860 runs) in this exclusive list. Kohli, however, has taken just 193 innings to achieve the feat. 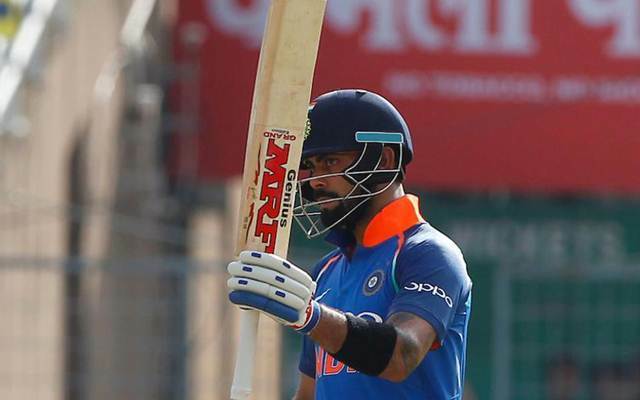 If you break down the tally, Virat has scored 2,472 runs in India’s Test wins, 6313 runs in ODIs and 1274 in T20Is, which gives him a grand total of 10,059 runs. On the other hand, the master Sachin Tendulkar contributed 5,946 runs in Test victories, 11,157 runs in ODIs and 10 runs in the lone T20I he featured in for a grand total of 17,113 runs. Rahul Dravid made 5,131 runs in Tests and 5,729 runs in ODIs, aggregating 10,860 runs in Indian wins. However, when it comes to the batting averages, Kohli is a long way ahead of all the stalwarts. He averages an exceptional 67.96 in the matches India have won across formats. Sachin stands a distant second with an average of 58.20 while Raul Dravid is a close third with an average of 56.85 in Indian wins. Among the top 10, MS Dhoni is the only other Indian batsman who has an average in excess of 60 during Indian wins i.e. 62.63.